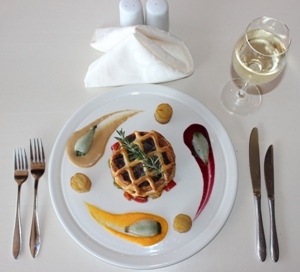 Winter Warmers Oxtail Recipe – De-boned oxtail and butter beans in a butter cream pastry case set upon served with crisp garden fresh vegetables. 1) Heat a heavy based pot up. Add butter and oil. Dust the oxtail pieces with the flour, salt and pepper mixture. Sear these pieces and remove from the pot and set aside. 2) Sauté the onions in this same pot. When caramelised add carrots, leeks, celery, garlic and rosemary and continue cooking. 3) Finish with tomatoes, red wine, and the first beef stock amount of 1 litre together with the oxtail pieces. 4) Simmer and add more stock when this amount has reduced, to the point of not covering the meat, and continue simmering for 8 hours, stirring occasionally. 5) Let it cool down and remove the bones. 6) Mix the meat with sauce/gravy of the oxtail that’s left over in the pot and the butter beans. 1) Pre-heat the oven to 200 °C. 2) Place the butter and water into a large saucepan and bring to the boil. 3) Remove from the heat and stir in the flour & salt until a smooth dough forms. 4) Turn the dough onto a lightly floured surface and knead the dough until smooth & elastic – about 5 minutes. 5) Roll the pastry out to 2mm thick and cut into appropriate size rounds for your pie dishes (use a jumbo muffin pan). 6) Lightly grease the pie dishes before lining with the cut pastry. 7) Fill the pastry casings with the deboned oxtail (the filling must be cold not hot). 8) Cut out rounds of the remaining pastry to form the lids for your pies. 9) Press the edges together to seal each pie and trim any excess pastry. 10) Cut a slit into the top of each pastry lid and brush with the egg. 11) Bake in the hot oven for 25-30 minutes, until golden and cooked through. 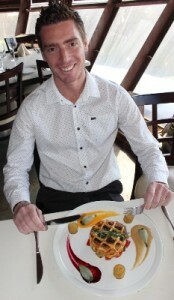 Recipe courtesy of the Cargo Hold Restaurant at uShaka Marine World and Chef Deno Sodalay. Call 031 328 8065 to make your reservation this winter!